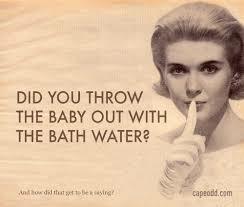 There is a saying that goes – Don’t throw the baby out with the bath water. Many people believe that this is a British saying. It is actually German. It is attributed to Thomas Murner, a German satirist and poet born in 1475. It is a simple saying that implies that we should be careful to retain good things rather than giving up on everything because parts of the whole are not working or are not workable. Often the fruits of a great idea take time to evolve. It is important that we keep the good things whilst we are seeking solutions. And so it is with the NDIS. Despite the many perceived benefits of the NDIS the response from Deaf people towards it has been varied. Much of this is because decisions are often inconsistent. There is concern because the criteria for access seems unduly harsh. Support provided is inconsistent and what one person gets another may not. The processes are also not always straight forward either. Plans are difficult to understand. The Portal is often down. Getting a hearing aid or a new speech processor for ones cochlear implant can seemingly take forever. It has not been plain sailing for many and this has caused much anger and frustration. Yet amongst all this anger are lots of success stories that very few people talk about. For example there was this 60 year old Deaf woman who had been attending a local arts course. For many years she simply attended, did her thing and went home. The NDIS rolled out in her area and she received interpreting to partake in her arts course. For the first time she had a proper conversation with other participants in the course. She discovered that a person who attended the course with her had an autistic brother, just like her. It might seem such a small thing but one of the major reasons for depression among deaf people is the isolation that deafness causes in big hearing groups. It is no small thing what the NDIS has achieved for this woman. She wasn’t finished there. She regaled me of a tale where her grandchildren had visited. Deaf grandpa was asleep. She used the pager to set off his new vibrating alarm clock. Grandpa woke up with a start. Grandchild found this immensely amusing. “Do it again nanny!! !” he implored. Grandpa was also the proud owner of a new hearing aid obtained through the subsidised hearing aids from the Office of Hearing Services. Sure it was not a top of the range model but it was his first new hearing aid in 20 years and he didn’t really care. And all of this because of the NDIS. I also attended a farewell for a work colleague who was hearing. A Deaf colleague booked interpreters for the event with his NDIS funds. We have all experienced these hearing and Deaf gatherings. Usually the Deafies are in one corner and the Hearies in another. There is usually sporadic interactions between the two. I have to be honest there was still a bit of a divide but the two groups actually did interact and had meaningful conversations. Access was had to speeches as well. The same colleague booked interpreters for his mothers birthday party. He told me he was really thankful because he could actually have a conversation with his bearded brother who was a bugger to lip-read. And even though there are families that are missing out on Auslan packages, usually because of the lack of knowledge of planners, there are families that are actually getting access to learning Auslan. This is for children and adults too. They are being encouraged to include extended family into these sessions so that inclusion within hearing families can improve. Sure, the provision of Auslan support is inconsistent and some are missing out but it is happening. While the inconsistency is frustrating we need to remember that as precedents are set awareness is created and such packages are likely to become more common. Counselling is also being provided. Where it can be shown that Deafness is isolating and causing depression and withdrawal counselling is seen as a way to build capacity and develop strategies to overcome these issues. Again the frustration is that it is not being provided consistently and again much of this is due to a lack of knowledge of many planners. It is frustrating but hopefully in time, as the system evolves and develops, we will see resources developed to assist planners understand deafness issues. We may also see a pool of subject matter experts who planners can consult for expert advice. One of the biggest issues of the NDIS is the pressure it is putting on the interpreting market. Unfortunately at this time the market cannot meet demand. It is likely to be this way for many years. This is cause for much concern. There is a big push at the moment to get programs going to train more interpreters. This is great and needed but is a long term solution. In the short term maybe there are things that we can all do. Utilising VRI might help as it will save many hours of travel time for interpreters thus freeing up time for them to actually work. Some of us can actually utilise captioning in some instances and where we can do this it will free up interpreters for those that really need them. At work I actually access an Auslan interpreter through VRI who is based in Japan when no one local is available. Interpreting is a limited resource and building talent is a long term solution. Perhaps we need more discussions about practical solutions as to how we can make the limited interpreting resource go further. It is true that we must continue to flag issues and problems. We must do this because if we do not improvements will never be made. Unfortunately there are many that seem to want to bring the system crashing down before it has had a proper opportunity to develop optimally. I understand the frustrations and even the anger because many people simply do not have the time for the NDIA to get its act together. Even so I firmly believe that the NDIS can and will be the best thing that could happen for people who are Deaf, HOH and who have disabilities. While we strive to make it a better system we need to be careful not. “To throw the baby out with the bath water.” All I ask is that we balance up the negatives with a good dose of positives. Sadly I think these positive stories are too few and far between. The stories are out there – Let us talk more about them.